Annalee Doll Description: Last one. Closed eues, closed mouth - as shown, beige body, white eyelet two piece dress, sun bonnet accented with a purple and white ribbon and African violets. Made in Meredith, NH USA. White on her outfit is not as white when compared to mint. Mesh hat is off-white due to being displayed. Hole on the bottom of her left heel where she originally had a wire stand. Annalee Doll Description: Open eyes, open mouth, white furry bunny, green ear linings, purple bow, holds resin chocolate egg in the shape of a tulip. This is like a stuffed animal, it does not have the wire frame inside. Smaller companions are 060104, 060204, 060304, 064204 and 064304. Annalee Doll Description: Last one. Open eyes, open mouth, beige body, pink floral stripe print outfit and matching Easter bonnet with pink satin ribbon, holds basket. Made in Meredith, NH USA. This is out of my personal collection. Annalee Doll Description: Last one. Open eyes, open mouth as shown, beige body, pink floral stripe print outfit and matching Easter bonnet with pink satin ribbon, holds basket. Made in Meredith, NH USA. Signed by Annalee on back in 1995. Annalee Doll Description: Open eyes, open mouth - as shown, red hair in pigtails. White dress with pastel stripe and bloomers, holds basket. Mom and Dad companions are item 0815-0810-84ox. Annalee Doll Description: Last one. Open eyes, open mouth - as shown, red hair in pigtails. White dress with pastel stripe and bloomers, holds basket. Mom and Dad companions are item 0815-0810-84ox. Two faint stains on the front of the right side of her dress where the trim is attached. Not really noticeable due to the basket handle and pink bow covering it. Stains might be able to be removed but I will leave that to the new owner. Doll is mint otherwise. Annalee Doll Description: Last one. Open eyes, open mouth - as shown, red hair in pigtails. White dress with pastel stripe and bloomers, holds basket. This is out of my personal collection. Made in Meredith, NH USA. Mom and Dad companions are item 0815-0810-84ox. Annalee Doll Description: Last one. Open eyes, open mouth - as shown, beige body, pastel check dress and pantaloons. Perfect to display with the Annnalee vegetables and keep out all summer long. Made in Meredith, NH USA. Annalee Doll Description: Last one. Open eyes, open mouth - as shown, beige body, pastel check dress and pantaloons, holds basket and eggs accented with white lace. Made in Meredith, NH USA. This is out of my personal collection. Annalee Doll Description: Last one. Closed eyes, closed mouth - as shown, beige body, pastel check dress and pantaloons, holds basket accented with white lace. Made in Meredith, NH USA. Annalee Doll Description: Open eyes, mouth expression may vary, white body, pink/ purple/ yellow check dress, purple bow in hair. Companion is 070904. Annalee Doll Description: Last one. Open eyes, open mouth - as shown, white furry body and ears, blue-green floral print dress, white pearls, bright pink ribbon in hair, holds bouquet of pink tulips, blue-green base. White head is not as white as when it was new, light brown stain the size of a pencil head eraser on the bottom of her left heel. Still is in really nice shape, but wanted to mention it. Companion is 071500. Made in Meredith, NH USA. Annalee Doll Description: Last one. Open eyes, open mouth, pink/yellow/lavender/blue/green floral print dress, green felt base has slight fading, only noticeable when foot is lifted. Made in Meredith, NH USA. Annalee Doll Description: Last one. Open eyes, open mouth with tongue, pink/yellow/lavender/blue/green floral print dress, green felt base has some raised areas in the felt. Not really noticable, but wanted to mention it. Doll is in mint condition. Made in Meredith, NH USA. Annalee Doll Description: Last one. Open eyes, open mouth - as shown,navy blue/green/pink/white floral print dress, holds umbrella, green base. Made in Meredith, NH USA. Annalee Doll Description: Last one. Open eyes, open mouth - as shown, green/pink/white floral print dress, green base. Made in Meredith, NH USA. Annalee Doll Description: Last one. Squinting eyes, open mouth - as shown, beige body, white with blue and lavender floral print dress, white lace bodice, blue satin bow in hair, navy blue felt base. Companion is 071599. Made in Meredith, NH USA. Annalee Doll Description: Last one. Open eyes, mouth expressions - as shown, white felt face, white furry body and ears, blue-green floral print outfits, blue-green base. Made in Meredith, NH USA. Annalee Doll Description: Last one. Open eyes, open mouths - as shown, white furry bodies, lavender floral outfits, purple bases. Top hat has creases from storage which is very common. Made in Meredith, NH USA. Annalee Doll Description: Last one. He has open eyes, open mouth and she has closed eyes, closed mouth, beige flannel bodies, hot pink/light pink/green/purple/yellow/white print outfits, with bright pink accents, wire stands covered with green felt. Very common for the sides to lift up. Stunning couple! Annalee Doll Description: Last one. Facial expressions as shown, beige flannel bodies, hot pink/light pink/green/purple/yellow/white print outfits, with bright pink accents, wire stands covered with green felt. Very common for the sides to lift up. Stunning couple! He is signed by Annalee on his back under his jacket and the bottom of her left foot is signed . Museum tag number is 181 for him and 182 for her. He has a few faint stains on the underside of the right elbow on his jacket and a very faint black spot on the tip of the left foot (size of the tip of a pencil). The set comes with note on tape written and approved by Annalee, "1985 sample 18" E.P. Boy/Girl Bunny (1 position) 9/18/84 AT". This was the way Annalee approved the samples before they went into final production. Annalee Doll Description: Last one. He has open eyes, open mouth with tongue, she has open eyes, open mouth - as shown, beige flannel bodies, aqua and pink stripe with white daisy print outfits, aqua accents, holds walking stick, green felt covered wire bases. His aqua hat, jacket and spats have overall fading, she is missing a basket of flowers so there is a glue spot on the inside of her left hand and has very faint spotting on her dress. It might be able to cleaned if you unsteam the dress and soak it. Slight fading on the tops of the green bases. Set is sold as is. Annalee Doll Description: Last one. Both have open eyes, open mouths - as shown, beige flannel bodies, blue with pink and white floral print outfits, blue and pink accents, matching blue felt bases. Very hard to find this set in mint condition. 10" size is item 0656-0654-88. Made in Meredith, NH USA. Annalee Doll Description: Last one. Facial expressions as shown, beige flannel bodies, blue with pink and white floral print outfits, blue and pink accents, matching blue felt bases. Very slight fading on his blue jacket. If you straighten his left arm, the crease is slightly darker. Not noticeable unless you look for it. 10" size is item 0656-0654-88. Made in Meredith, NH USA. Annalee Doll Description: Last one. Both have closed eyes, closed mouths - as shown, beige flannel bodies, blue with pink and white floral print outfits, blue and pink accents, matching blue felt bases. Very hard to find this set in mint condition. 10" size is item 0656-0654-88. Made in Meredith, NH USA. Annalee Doll Description: Last one. Closed eyes, closed mouths - as shown, white/pink/blue/green/yellow floral print outfits accent with pink satin ribbon, he has and aqua felt base, she is missing hers. The good thing about her not having a base is that now she can be postioned sitting in a chair, riding a bike, sitting next to him, sitting on a couch, etc. The base can be changed from one to the other depending how you want to display the. Made in Meredith, NH USA. Annalee Doll Description: Last one. He has open eyes, open mouth with tongue, she has squinting eyes, open mouth - as shown, white/pink/blue/green/yellow floral print outfits accent with pink satin ribbon, aqua bases. Slight fading on the tops of the aqua bases, he has about 6 very tiny bite marks on his right hand which do not show unless you look for them (maybe a cat). Made in Meredith, NH USA. Annalee Doll Description: Last one. Facial expressions - as shown, white/pink/blue/green/yellow floral print outfits accent with pink satin ribbon, wire bases. Made in Meredith, NH USA. Annalee Doll Description: Last one. Open eyes, open mouths - as shown, lavender floral print outfits with purple accents, green bases. Made in Meredith, NH USA. Annalee Doll Description: Last one. He has open eyes, open mouth with tongue, she has open eyes, open mouth - as shown, lavender floral print outfits with purple accents, green felt bases. Made in Meredith, NH USA. The purple jacket, spats and hat have slight fadin. Not noticeable unless you flip the jacket or move the band on the top hat. She is perfect. Annalee Doll Description: Last one. He has open eyes and she has closed - as shown, lavender floral print outfits with purple accents, green felt bases. Made in Meredith, NH USA. Annalee Doll Description: Last one. Both have open eyes, tan bodies, pink/blue/rose/green floral outfits, he holds a walking stick and she holds basket with ivy. Slight fading on green bases. Only noticeable if you lift the feet. Made in Meredith, NH USA. Annalee Doll Description: Last one. Both have open eyes, open mouths - as shown, tan bodies, pink/blue/rose/green floral outfits, he holds a walking stick and she holds basket with ivy. Very slight fading on tops of green bases, otherwise mint. Made in Meredith, NH USA. Annalee Doll Description: Last one. Both have open eyes, open mouths - as shown, tan bodies, pink/blue/rose/green floral outfits, he holds a walking stick and she holds basket with ivy. Made in Meredith, NH USA. These dolls are mint in bag and were never removed from the bag except for the photo. I graded the set as excellent because the cardboard that held her hat in place from the factory was attached with masking tape and the tape left a tan mark (1.5" x 1") on the top of the brim of her hat when I removed it for the photo. They are mint otherwise. Annalee Doll Description: Last one. 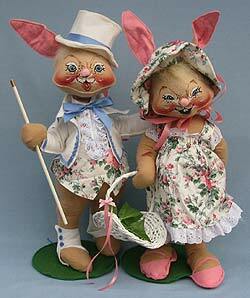 He has open eyes, she has closed - as shown, tan bodies, pink/blue/rose/green floral outfits, he holds a walking stick and she holds basket with ivy. Made in Meredith, NH USA. Annalee Doll Description: Last one. He has open eyes and she has closed eyes - as shown, tan body, pink/blue/rose/green floral pansy/lily print outfits, he holds a white walking stick, green bases. Made in Meredith, NH USA. Annalee Doll Description: Last one. Both have open eyes, open mouth with tongue - as shown, tan bodies, pink/blue/rose/green pansy/lily floral print outfits, he holds a white walking stick, green bases. The white felt on their white shoes/spats is more of an off-white and slight fading on the tops of the green bases due to being dispayed, otherwise near mint. Made in Meredith, NH USA. Annalee Doll Description: Last one. She has open eyes, open mouth - as shown, he has open eyes, closed mouth with two teeth - as shown, beige bodies, pink daffodil print outfits, green bases. Adorable set. Made in Meredith, NH USA. Annalee Doll Description: Last one. Open eyes, open mouths - as shown, green/pink/white floral print dress and vest, he holds walking stick, green bases. Made in Meredith, NH USA. Annalee Doll Description: Last one. Open eyes, mouth expressions - as shown, green/pink/white floral print dress and vest, he holds walking stick, green bases. His hat has bends in it due to storage as shown in photo. Made in Meredith, NH USA. Annalee Doll Description: Beige bodies, white with blue and lavender floral print outfits, navy blue bases. Facial expressions may vary from photo. Adorable set. Made in Meredith, NH USA. Annalee Doll Description: Last one. Open eyes, open mouth with tongue - as shown, floral print vest, holds walking stick, white shirt/top hat/spats, holds white walking stick. Made in Meredith, NH USA. Fading on the back of the purple vest - probably from being displayed in a window, slight fading on top of green base and white spats are not as white when compared to the hat. Sold as is. Annalee Doll Description: Last one. Open eyes, open mouth with tongue - as shown, beige body, white with blue and lavender floral print vest, white lace jabot, blue satin bow, navy blue top hat, navy blue felt base. Companion is 071099. Made in Meredith, NH USA. Annalee Doll Description: Last one. Squinting eyes, open mouth with tongue - as shown, beige body, white with blue and lavender floral print vest, white lace jabot, blue satin bow, navy blue top hat, navy blue felt base. Companion is 071099. Made in Meredith, NH USA. Annalee Doll Description: Last one. Open eyes, closed mouth with teeth - as shown, white furry body, purple, green, and white floral dress and hat, white lace trim, holds purple flowers. Companion is 071805. Annalee Doll Description: Last one. Open eyes, closed mouth with two foam front teeth, white furry body, white feather hair, yellow furry hat accented with daisies, pink ear linings and pads on feet, yellow bow, holds daisies. This doll came from Annalee Design and was never put into production! The neat thing about this doll is that the teeth are pieces of foam and the center of the face is raised to simulate the nose. Annalee Doll Description: Last one. Open eyes, open mouth - as shown, pink satin bow in hair, robin's egg blue with white heart dress with white eyelet trim and pink satin bow, white pantaloons with white eyelet trim and pink bows, holds dress with flowers. Very hard to find this in mint condition. Companions are 072086, 073085 and 072586. Made in Meredith, NH USA. Annalee Doll Description: Last one. Closed eyes, closed mouth - as shown, pink satin bow in hair, robin's egg blue with white heart dress with white eyelet trim and pink satin bow, white pantaloons with white eyelet trim and pink bows, holds dress with flowers. Very hard to find this in mint condition. Companions are 072086, 073085 and 072586. Made in Meredith, NH USA. Annalee Doll Description: Open eyes, open mouth - as shown, pink satin bow in hair, wide brim straw hat, robin's egg blue with white heart dress with white eyelet trim and pink satin bow, white pantaloons with white eyelet trim and pink bows. Companions are 072085, 073085 and 072586. Made in Meredith, NH USA. Annalee Doll Description: Last one. Open eyes, open mouth with tongue - as shown, pink satin bow in hair, wide brim straw hat, robin's egg blue with white heart dress with white eyelet trim and pink satin bow, white pantaloons with white eyelet trim and pink bows. Very slight difference in blue color when compare creases in dress.Companions are 072085, 073085 and 072586. Made in Meredith, NH USA.